My 7 year old son loves frogs. He raised frogs from tadpoles this summer and he has been fascinated with them ever since. 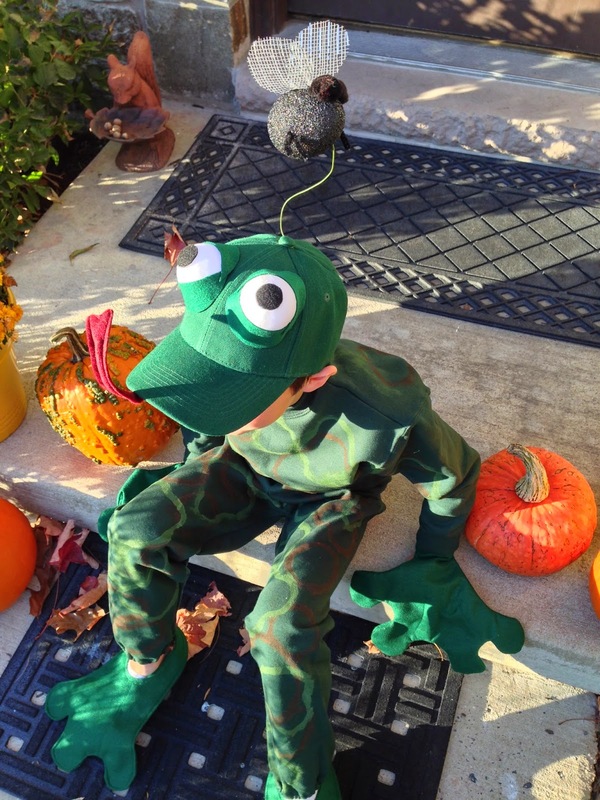 I spent a lot of time thinking about how I would create a frog costume. 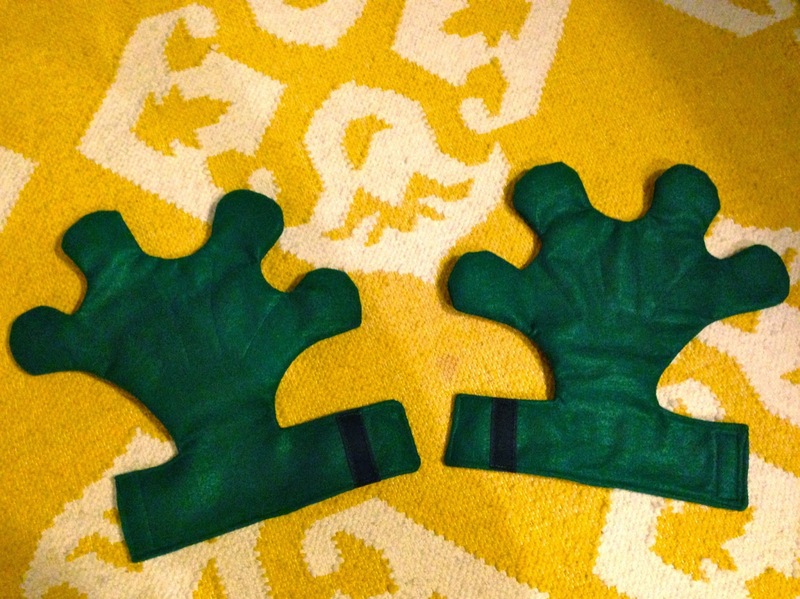 Believe it or not, I do have some frog costume creation experience. During college I was a Budweiser frog (along with two of my girlfriends). 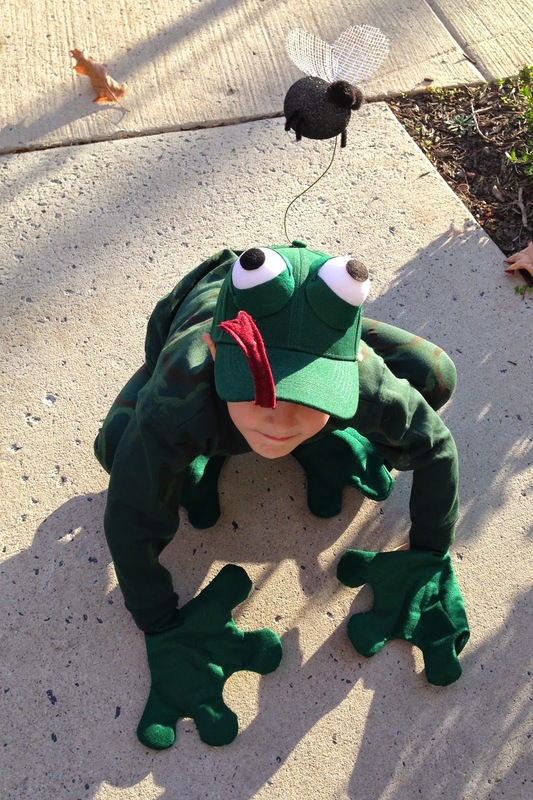 My 7 year old makes a much better frog than we did. There are 3 components to this costume 1) the body, 2) hands and feet, and 3) the head with buzzing fly. The body was the easiest part. I used the fabric paint and cardboard stencils to paint a random pattern on the sweatsuit. My son helped with this part of the costume. Although this part took a while, my son enjoyed getting to help and it makes the sweatsuit look like more than just a green sweat suit. 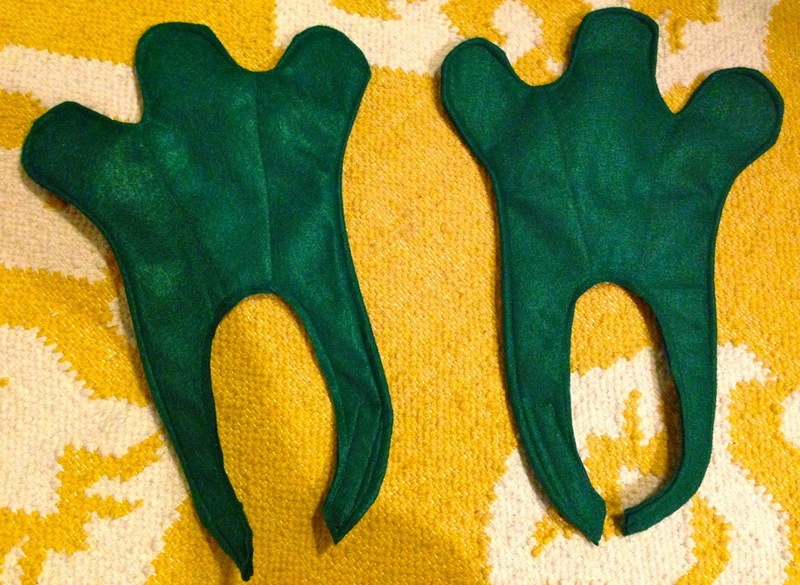 The hands and feet were the only part of costume that required sewing. 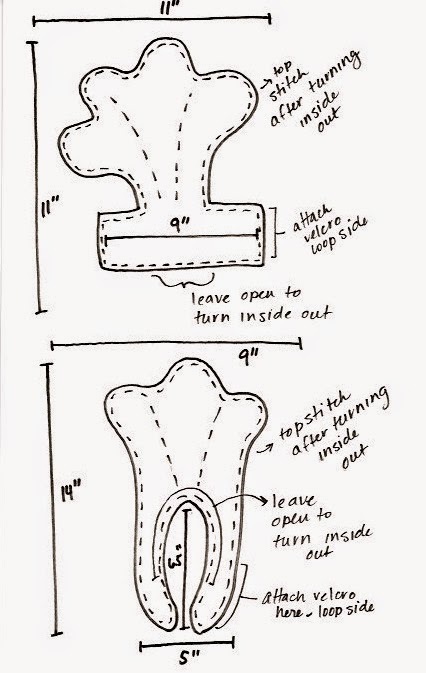 To make them I cut out two pieces of the pattern I created for each (see sketch below), sewed them together (leaving an opening - like you'd do if you were sewing a pillow) turned them inside out and topstitched them to close the opening. I added velcro to secure them to my son's wrist and ankles. After adding the velcro to the hands I figured out that I didn't really need the loop sections of velcro. The hooks stuck to the felt really well. 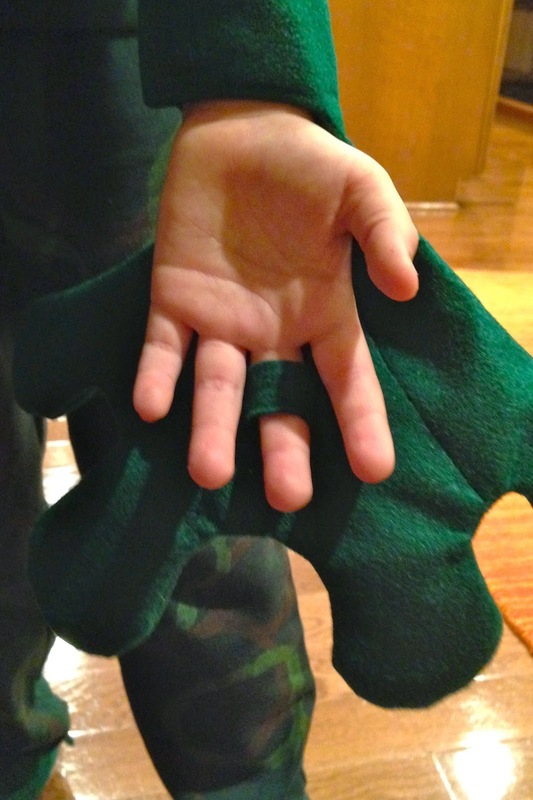 On the underside of each hand, I sewed a little felt loop for my son's finger. The loop helps to keep the hands in place but enables him to use his hands to grab candy etc. The hat looks more complicated than it was to construct. The first thing I tackled was the eyes. I cut two domes off the ends of two styrofoam eggs (I used a serrated knife to do this) and covered them with sections of opaque white nylon tights that no longer fit my daughter. I used short sewing pins to secure the nylon to the bottom of the eggs. Next I used hot glue to attach the eyes to the hat. I cut out crescent shaped pieces of felt and secured them to the top and bottom of the eyes. 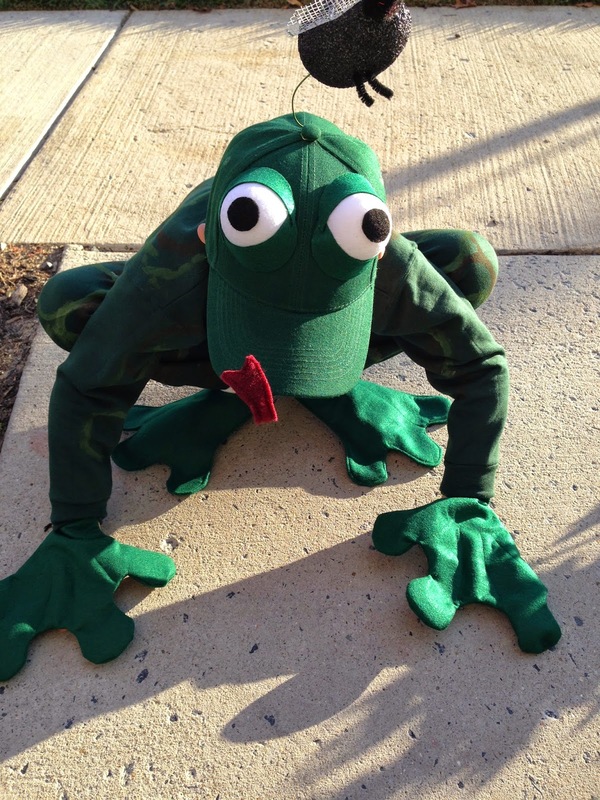 This gives the hat a more professional look and makes the eyes look more like frog eyes. I used a scrap of black felt to cut out the black pupils. To make the fly, I sprayed a styrofoam egg black. I used silver deco mesh to make the wings and attached them with sewing pins. I used piper cleaner to make the legs and black craft pom-poms to make the fly's eyes. I attached the fly to the top of the hat with a piece of floral wire. I wrapped one end of the wire around the little bottom thing on the top of the hat and poked the other into the side of styrofoam fly. I love the little fly! Lastly, I used a scrap of red felt and a pipe cleaner to make the tongue. I cut out two pieces of felt shaped like a tongue. I sewed them together leaving an opening at the base. I inserted the pipe cleaner in to the opening then attached the tongue to the under side of the hat with hot glue. My son can't wait to wear his costume to school and trick or treating on Halloween.